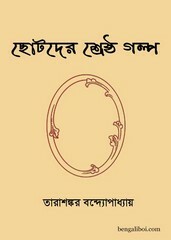 Tarashankar, a prominent penman of Bangla Bangla literature. He practiced poetry in the first life but his talent flourished in novels and short stories. He is a suitable successor after Bankimchandra, Rabindranath and Sharat Chandra. Three Bandopadhyay appearing in Bengali literature-among them, he is one of the best author. He wrote several stories for children, now I'll share with all my dear little friends a stories collection book for you. The ebook has six sweet story and ebook pdf has 108 pages with 5mb file size.